Da Bears Blog | How can the Bears win with Jay Cutler? How can the Bears win with Jay Cutler? That’s been a common argument by many fans fed up with Cutler, who was the poster child of a disappointing 2014 year, as they campaigned for the Bears to move on and find a fresh face for the 2015 season. Since then, the Bears have committed to Cutler as their quarterback for 2015. So let’s get away from the debate about whether or not that was a good idea (I believe reasonable arguments can be made for both sides) and instead focus on how Chicago can maximize their 2015 success with Cutler under center. Contrary to what some might say, the Bears have actually won with Cutler in the past, as they are 44-38 in games he has started, but their winning percentage in games he plays in each season has fluctuated from 33% to 70%. Let’s take a look at what changed in seasons where the Bears won with Cutler compared to times when they lost with him in an effort to figure out how they can win with him again in 2015. In an effort to try and figure out what changed in those seasons, I looked at the correlation between Chicago’s win percentage in games Jay Cutler started for his six seasons in Chicago and 12 different variables across a number of general areas. In order to evaluate Cutler’s performance, I examined passer rating, touchdown percentage, interception percentage, and touchdown/interception ratio. Since the average NFL passer rating has increased by about 6 points in those 6 years, I used the difference between Cutler’s passer rating and the NFL average that year. In order to evaluate the offense as a whole, I looked at their rankings out of the 32 NFL teams in both yards per game and points per game. In order to evaluate the defense, I looked at their NFL rankings in both yards per game and points per game allowed. In order to examine the importance of turnovers, I looked at turnovers per game, takeaways per game, and turnover differential per game. In order to account for the caliber of opponent the Bears faced, I looked at opponent win percentage. In all of these categories, I only included data for the games Cutler started. For the offensive and defensive NFL ranks, I slotted the Bears where they would have fit based on their per-game stats for this sample set. For the categories where lower numbers are better, I manually changed the sign of the correlation to accurately reflect the results. 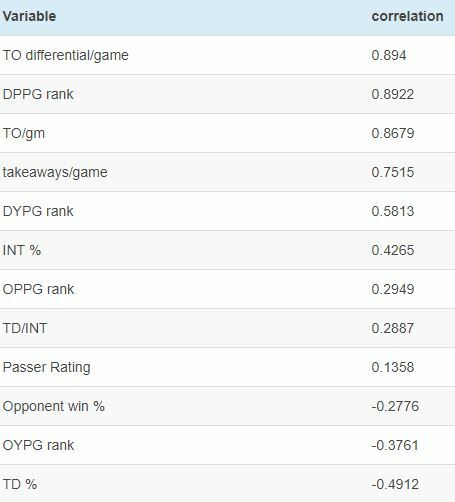 This applied to interception percentage, all of the offensive and defensive rankings, turnovers per game, and opponent win percentage. The table below shows the correlation between Chicago’s winning percentage in games Cutler starts each season and their performance in the 12 categories for those games. The first and most important point to make here is that correlation does not equal causation. This is especially true since this data set spans two different coaches who operated with very different philosophies, which can skew the numbers. Only having six years is also a small sample size, which is why I looked at multiple variables in a category when possible. However, there are still some clear trends that can be seen here, and it seems reasonable to suggest there is some merit to them. For starters, Chicago’s offensive performance seems to have little to do with their team success when Cutler is under center. Points per game scored has a low correlation to winning percentage, and offensive yards per game actually has a negative correlation, though again it is fairly small, and I don’t think it means anything. Likewise, Cutler’s individual performance does not seem to have much impact on Chicago’s overall success with him under center. The only two factors that have a somewhat meaningful correlation to win percentage are touchdown percentage and interception percentage, but touchdown percentage is actually negatively related to winning percentage. Opponent win percentage also proved to be negligible. The two areas that clearly impact the Bears’ winning percentage when Cutler is under center are defensive performance and turnovers, which were also the two hallmarks of Lovie Smith’s teams during Cutler’s first four years in Chicago. Both defensive categories had a correlation above 0.5, and defensive points per game had a very high value of 0.89, indicating a strong relationship between the defense’s performance and Chicago’s overall winning percentage. Turnovers are an interesting category to look at, as the biggest knock against Cutler as a quarterback is that he turns it over too much. Indeed, the largest correlation between Cutler’s performance and Chicago’s success is interception percentage, though a 0.43 correlation is still not overly large. The turnover differential per game has the largest correlation to team success, though turnovers per game and takeaways per game were both extremely important as well. One important point to make about turnovers in this case is that they do not only include interceptions; other players can turn the ball over too, and Cutler can fumble the ball away. Total interceptions and interception percentage are also two very different numbers; Cutler actually threw interceptions at the 2nd lowest rate of his Bears career in 2014 despite throwing the 2nd most interceptions that same season, a reflection of his 561 passing attempts that marked a new Chicago high for him. Total turnovers had a much higher correlation than interception percentage, which is partially due to fumbles being added in, but it also suggests that the Bears would do well to limit Cutler’s passing attempts and establish a more balanced offense. While not conclusive by any means, this data suggests that coaches of a team with Jay Cutler as their starting quarterback should focus on defense and turnovers, which can be limited in part by running the ball more. This is not exactly earth-shattering news, but it is refreshing to see numbers match up with what common sense seems to dictate. It should also make Bears fans happy to think that Chicago’s coaching hires this offseason indicate a desire to focus on defense and running the ball. One logical question that can be raised in response to this conclusion is whether Cutler’s contract is too financially cumbersome for the Bears to build a quality defense. While Cutler’s contract is in line with the quarterback market around the NFL, this is a fair question to ask. Quarterbacks, especially mid-tier quarterbacks, making as much money as Cutler does are a relatively new occurrence, and early evidence indicates that these salaries may in fact be too cost prohibitive to build a championship-caliber roster around. Based on that fact alone, I think looking for Cutler’s eventual replacement in one of the next two drafts is an excellent idea. A solid quarterback on a rookie contract is the biggest bargain in the NFL, and acquiring one in the near future needs to be Ryan Pace’s top priority. In the meantime, the good news for Bears fans is this: the Bears have won with Jay Cutler before, and there is a clear blueprint they can follow to do it again.